©2011 - Andy Snowden, webmaster. Logo owned by Billie Creek Village, Inc.
After surviving 70 years of sun, storms and flood it was closed to traffic in the late 1970's. The bridge has suffered two arson attempts, one on August 9, 1979 and the other on August 15th of the same year. If you look closely at the beams towards the bridge's ends, you can still see burn marks from those attempts. As the result of a joint effort by Parke County, Inc. and Billie Creek Village, the bridge was dismantled and the frame moved to the Village in the spring of 1980. After a complete restoration, it now serves as the stately entrance to our Village. The Beeson bridge was built in 1906 by the Frankfurt Construction Company. Marshall, Indiana and was named for adjacent landowners when it was built. It is of Burr Arch Construction and is 55 feet long, 16 feet wide and has a clearance of 13 feet. The Beeson Covered Bridge is the only remaining bridge in Parke County built by a professional construction company. It originally crossed Roaring Creek on the back road from Marshall, Indiana. This log cabin was built in the 1830's on Roaring Creek, northwest of Marshall, Indiana, in Parke County's Washington Township. The William Beeson family owned the home in the early 1900's and gave financial assistance towards its restoration. Dale DePlanty actually gave the home to the Village and together the "Beeson-DePlanty" Cabin was moved approximately ten miles to the Village in 1969. The cabin is 18 feet by 22 feet. The logs are poplar, hand-hewn and shaped with an adz. An adz is a hand-cutting tool that has a thin arched blade set at right angles to the handle and is chiefly used for shaping such wood. The floor is made of sassafras wood. No nails, spikes or straps hold the structure together. What you see between the logs is a yellow clay mixture called "chinking". This was in keeping with early building practices. Some of the chinking is still intact after 100 years. It is of special interest to note that - the Beeson Covered Bridge and the Beeson-DePlanty Cabin lie in the same geographical style as they did when originally built. It is during a special event held during the last weekend of February and the first weekend in March -(when the sap flows from Maple trees) that the Maple Syrup Camp is in operation. It is noted as a "primitive" camp because no gas or electric heat source is used. When the Catholic congregation of St. Joseph's in Rockville decided to build a new church, they offered the old structure to Billie Creek Village. But it seemed for a time that the historic church would be destroyed. The money needed for the move here to the Village was not available; and time was not on the Village's side ... the new church was waiting to be built. In the "12th-hour" the $10,000.00 necessary for the move was donated by Mrs. Anton (Tony) Hulman of Terre Haute, Indiana. The process is powered by a wood-burning unit that heats the sugar water (sap) and turns it into maple syrup. Our camp consists of an evaporator, fuel supply (wood) and sugarhouse. The principle of the evaporator is to spread the sap (collected from maple trees) out in a thin film, bringing it into the closest possible contact with the heat source, and converting it, quickly into maple syrup. There are two requisites for "good" sugar wood (fuel/heat source). The wood must be very dry and should be cut into 3-foot lengths. Much research and time has gone into determining these two requirements. They give the best and most efficient use of fuel supply. The purpose of a sugarhouse is to shelter the operator, protect the evaporator, provide storage space for tools and sometimes provide covered space for the wood supply. Most sugarhouses are built to be as "fireproof" as possible, as a result, little wood was used. This process produces the maple syrup of the type sold here at Billie Creek Village in our General Store and placed atop our ice cream sundaes. 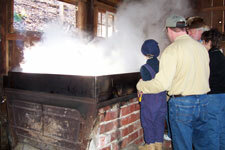 Parke County offers tours to several operating sugar camps during the annual Maple Fair held on the last weekend in February and the first weekend in March. 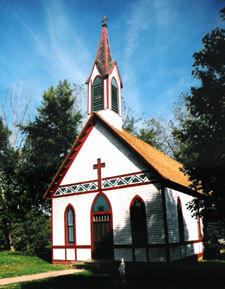 The church was originally erected in 1886 and served the Rockville congregation for 85 years. The interior boasts a vintage communion rail, altar, pews, early nativity scene and other items. The church rests on a sandstone foundation. A later addition of a front entry has been removed. The church's original location was on East Ohio Street (U.S. 36) in Rockville where the new St. Joseph's Church now sits. The only difference being that the old church faced west, as it does now, and the new one faces North. The church is available for weddings and services. A Chautauqua was an organization combining education, recreation and religion. It took its name from Chautauqua Lake, New York, where the first meeting was held in 1874. These were commercial ventures, which during the summer months, provided three to seven day programs in circus tents for residents of small towns across the country. The programs emphasized popular lecturers, music and dramatic entertainment. With the coming of the motion picture, the mass production of the automobile and the radio, their popularity declined rapidly. The original Chautauqua Pavilion still stands today at the center of the fore mentioned Beechwood park. 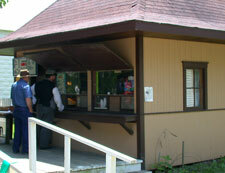 What is now called The Billie Creek Refreshment stand was built as a cookhouse to feed the hundreds of hungry patrons who attended the annual Rockville Chautauqua. This structure was built in 1911 at Beechwood Park on the Southwest corner of town. It has accommodated the appetites of such notables as Rev. Billy Sunday, Williams Jennings Bryan and former President William Howard Taft. The Republican, which has since merged with its former rival the Rockville Tribune, is now known as the Parke County Sentinel. It is one of the oldest newspapers in the state of Indiana. The Covered Bridge Courier Office has been a working part of Billie Creek Village in the past and still prints special orders for the Village and Farmstead. The main attraction in this building is the four-page Miele "flatbed" press, which was manufactured in 1899. There is also a "job" press of the same era, an early linotype machine, a newspaper folder and a wide variety of Civil War era handset type. The building is an authentic reproduction of a country newspaper office of the era and every piece of equipment in the shop is operational when experienced operators can be found. Recent structural difficulties have caused the dislocation of the massive multiple ton flatbed press. A solution is being sought to correct the problem. This print shop is housed in the building formerly occupied by the Bellmore telephone switchboard office during the late 1800's. It was moved from its original site on the northeast corner of U.S. 36 and State Road 59 in Bellmore, Indiana, to the Village in 1971. Most of the printing equipment found in the building today was used in publishing the Rockville Republican that was first printed in 1832. The history of this building is quite sketchy at this time, but the Billie Creek staff is working to restore the building to its original purpose and document its original beginnings. It is known that since it was originally a post office, it has been home to a car dealership, real estate office, chicken coop and meeting place for local "card players". Today it houses temporary exhibits to the village. In December of 1982 it was moved to Billie Creek Village. 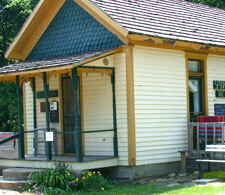 It is currently set up as an indoor dining room as well as home to Billie Creek Village special exhibits. This building was built prior to 1904 and originally housed a monument sales company. In later years the Gaebler Building was home to a car dealership, Laundromat, liquor store and a drug store. It is a unique tin structure that has both interior and exterior tin siding. Take special note of the limestone corners. This limestone was set in place and carved exactly to match the "tin" design. The building (tin and stone) was then painted alike in order to create a matching look. If you look closely, you can still see some of the original paint in the limestone "cracks". Dr. Harrison J. Rice was born in Shelby County, Kentucky, on August 8, 1823. His boyhood days were similar to those of other farmer lads of his time. During most of the year, he worked hard at farm chores, but found time to attend a short term of school in the winter. He had a receptive mind and made the most of the scanty educational advantages afforded by the primitive log schoolhouse. Later, he entered Wabash College, in Crawfordsville, Indiana, where he remained for two years, and gained knowledge of Latin, Greek and the higher mathematics. In about 1845, Mr. Rice determined to adopt the medical profession, came to Rockville and entered the office of his uncle Dr. James L. Allen and became a student. He later attended lectures at Louisville, Kentucky, and attended Jefferson Medical College of Philadelphia; graduating from that institution in 1849. Also in 1849 he married Miss Nancy Moxley and formed a partnership with his uncle Dr. Allen. Upon Dr. Allen's death in 1857 he took over the practice as sole owner/physician. This building, was originally a Greek revival structure. It was remodeled around 1865 with Italianate roof brackets and again in 1875 with the longer windows and gaslights. Its original location was on the east side of Market. The tour is not yet completed!